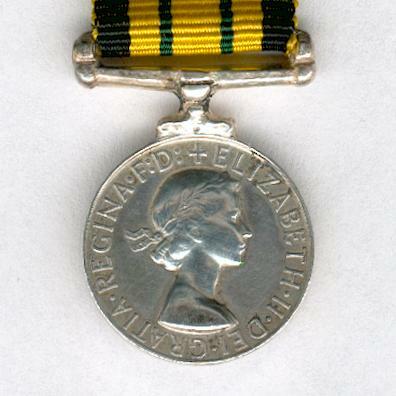 Miniature circular silver medal on claw and fixed ribbon bar suspension; the face with the young uncrowned head of Queen Elizabeth II facing right, circumscribed ‘ELIZABETH • II • DEI • GRATIA • REGINA • F: D: +’ (Elizabeth II by the Grace of God Queen, Defender of the Faith); the reverse with the standing figure of Britannia, a trident in her right hand, her left arm extended, a standing lion facing right behind her, a radiant rising sun in the distance to the right, inscribed ‘AFRICA’ below; diameter 18.33mm (0.72 inch); on original ribbon with ‘KENYA’ clasp. 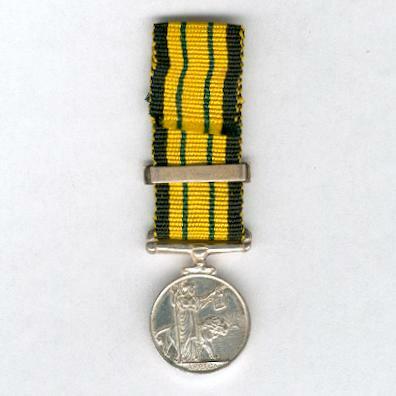 The medal was instituted in 1902 to be awarded for minor actions where no specific campaign medal was awarded. 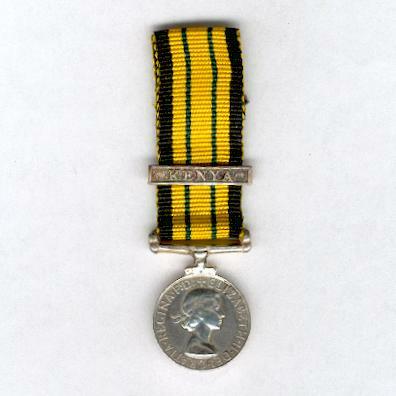 Most recipients were local African troops with some detached and specialist European officers but the campaign against the Mau Mau uprising in Kenya, 1952-1956 was an exception. 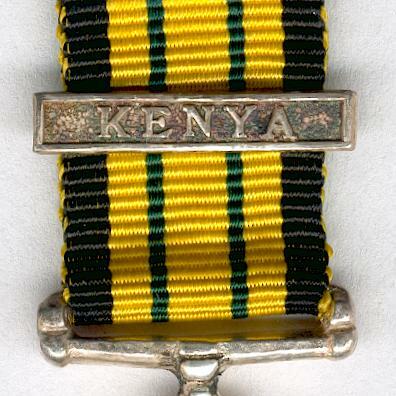 The ‘Kenya’ clasp was awarded for 91 days’ service (30 days for aircrew) in the Central and Southern Provinces of Kenya and Naivasha, Nakuru and Laikipia Districts, Rift Valley Province, Nairobi Extra-Provincial District and that part of Isiola township and Leasehold Area in the Northern Province between 21 October 1952 to 17 November 1956. 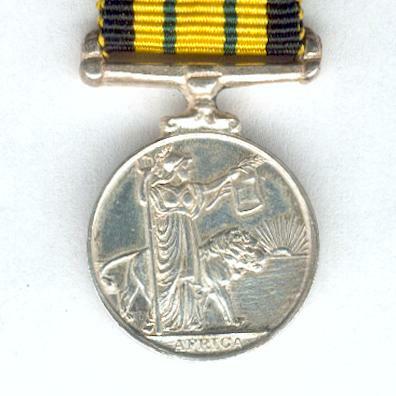 The medal was discontinued in 1956. A good original miniature.